When we awoke on Monday morning it was 23 degrees in Cortez, Colorado and it was time to move on. Monday afternoon we arrived in Moab, Utah and 78 degrees. The warmest temperature we have seen in sometime. Moab, located between Arches National Park and Canyonlands National Park, is a magnet for off road bicyclists and 4X4 drivers. This is apparently the busy season and for the first time we had some difficulty finding a site that would include the weekend. We ended up at the Moab KOA and could only get a backin site. This is an older KOA with very narrow interior roads and narrow pads to park the trailer. The first site they gave us we simply could not get into, so they gave us an easier site to back into. It took us sometime, but we did get the trailer into it safely. The KOA in Cortez had been off the main road, was quiet and had the public park next door. Our site here in Moab is about 100 feet from the only road into and out of town and is decidedly not quiet. It does have a nice view of the LaSal Mountains and a red rock cliff across the road. Tuesday we did domestic things like pickup some groceries and get the truck serviced. The high of the day was 83! This is the hottest temperature we have seen this year. It is probably redundant to say it but of course, it has been windy. Wednesday we went to visit Arches National park. This is a spectacularly beautiful red rock area. 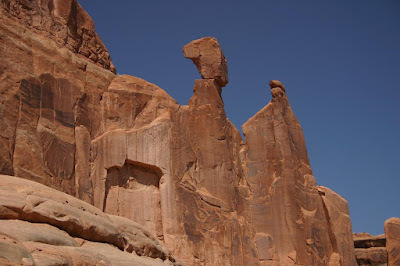 There are indeed natural arches everywhere in the park, many over 100 feet long and over 100 feet high. The day started out clear but windy. As the day went on it got cloudier and darker, by late afternoon is was very cloudy and looked like rain. Naturally it never did rain, but there was fresh snow on the LaSal Mountains. We haven’t been in any rain since Tucson in February and could really use a good rain to wash all of the red dust off of the trailer. Another reason for coming to Arches was to meet with Howard and Linda Payne. 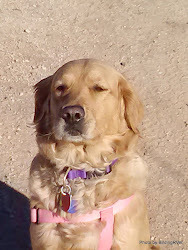 Who have been Campground Hosting at the only campground in Arches for the past two months. 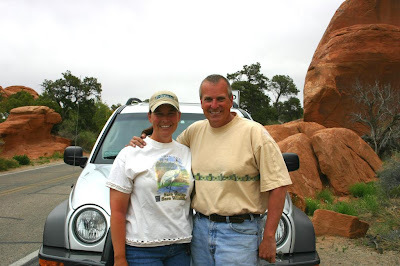 In their early forties with no prior RVing experience, Howard and Linda sold their business, sold the house, and gave up their country club life style to become full time RVers. I have been following their blog and on occasion emailing them for the past two years and finally got to meet them in “real” time. From the beginning Howard started a web site to help other newbie or wanabe fulltimers: RV-Dreams.com . 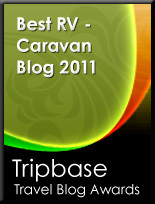 In the past two years this has grown into a RV Forum RV Dreams Forum a blog site RV-Dreams Journal with 1500 visits a day and even an RV Rally RV-Dreams Rally. Many of the RVers that we have met since we have been on the road we met online first through the RV-Dreams Forum. Because we also follow Howard & Linda on the web, we now have found you guys! We are fulltime RVers (2.5 yrs)and just began "birding" this year while wintering in South Texas. We are seeking advise on what kind of binoculars are best for this hobby. Any advise? "Because we also follow Howard & Linda on the web, we now have found you guys! We are fulltime RVers (2.5 yrs)and just began "birding" this year while wintering in South Texas. We are seeking advise on what kind of binoculars are best for this hobby. Any advise?" Generally the best binoculars are 8X42 or 7X35 because they have the widest field of view and are easiest to keep steady. Any thing 10 power has too narrow a field of view and is hard to hold steady. Any thing like a 7X50 are just too heavy for birding. Waterproof binoculars have come way down in price and are great feature; not because you plan to bird in the rain but because it could rain while you are out. Also in humid areas if the internal lens fog up there is nothing you can do. Beyond that they have to fit your face. Do they open wide enough or do they close close enough for your eyes. Does the focus ring fit your hand and finger length. To find out you just need to try different pairs of binoculars. Bird seed stores like Wild Bird Center and Birds Unlimited or the local Audubon store usually have the best selection. As KOA's go, that one looks really nice! You got some really good pictures of all of those precarious stone structures. I love watching the slide shows! For a unique adventure, Bay Bayou RV Park in Tampa, Fl have a colony of yellow crowned night herons. They come March 1st and as of today, June 7th, the young are just about ready to fly. There are at least four nests with two chicks each. They are literally right over the RV sites. One site is reserved for them since these rather large birds can make a mess. One of the main park roads is their flyway. Since the park is on the bayou, there are lots of other birding opportunities, but the Night Herons are spectacular. Winter reservations are hard to get but well worth it to live right under these magnificent creatures!